As I mentioned briefly in this week’s Inventory, I first heard WFMU disc jockey Tom Scharpling refer to Creedence Clearwater Revival as “America’s Beatles” on his show about five years ago—a claim that later turned up in the hilarious Scharpling & Wurster bit “Gas Station Dogs.” But it’s no joke: In a lot of important ways, CCR really was America’s Beatles. Maybe the most important factor was their indefatigable hit-making ability: From 1968 until their demise in 1972, they released no less than 15 top 40 hits, including an astonishing nine-song stretch from January 1969 (when “Proud Mary” was released) to July 1971 (with “Sweet Hitch-Hiker”) when every single they put out hit the top 10. But the similarities went beyond mere chart success: There was the songwriting tension between brothers John and Tom Fogerty that overshadowed the excellent work of sidemen Doug Clifford and Stu Cook, mirroring the way John Lennon and Paul McCartney’s struggles came to dominate The Beatles; the way both bands co-opted an “alien” sound (American rock ’n’ roll for the Liverpudlian Beatles, and Southern swamp boogie for northern California’s CCR) to help create something truly unique; their tireless studio perfectionism; and often-bitter clashes, both within the band and with their record companies. Both bands broke up acrimoniously after a short time (The Beatles’ recording career lasted only seven years, and Creedence’s only four), and both made contributions to rock music that reverberated for decades, with The Beatles transforming the whole notion of guitar pop and CCR almost single-handedly inventing roots rock. Only one of the two ended up in The Big Lebowski, though. On the “quintessentially American” tip, I’d throw my vote in for The Jackson 5/The Jacksons, if only for the way the band’s rise and fall encapsulates the American Dream, flaws and all. Formed in Gary, Indiana by a father who longed, Gatsby-like, for the bright lights of the nearby Chicago R&B scene, the band rose to prominence singing songs crafted in the manner of America’s greatest innovation: the assembly line. The Jackson 5’s first four singles for Motown—“I Want You Back,” “ABC,” “The Love You Save,” and “I’ll Be There”—shot to the top of the Billboard Hot 100, after which the Jacksons ceased being a family and a band, and became a machine. Joe Jackson went nuts, Michael Jackson lost his childhood, but the machine kept humming along, sputtering a bit after it left Motown, but still charting records and singles as Michael’s solo achievements were eclipsing his work with his brothers. (1984’s Victory, the last Jacksons record to feature The Gloved One, also scored the group its final two top 40 hits.) The Jacksons’ story is an unfortunate model of the American drive for success at any cost, but that doesn’t mean that even later cuts like “Shake Your Body (Down To The Ground)” (which prefaced Michael’s Rubber Soul-esque reinvention with Off The Wall) don’t sound great. The band that first comes to mind when I think about an American Beatles—and refuses to leave the mind, no matter what—is The Beach Boys. The parallels are pretty obvious. Both began by offering an inventive, high-spirited take on pop music that fit into the landscape of what was already there, while still sounding like nothing else on the charts. There are key differences, of course. Listeners followed The Beatles down whatever path they chose to explore, even keeping the idea of the band alive after it fractured into a collection of barely-speaking-to-each-other solo artists who happened to share a studio. The Beach Boys’ 1966 masterpiece, Pet Sounds, was a cult item at the time of its release—relative to the band’s past success, at least—and remains better known to serious music fans than to casual listeners. And while there’s much greatness to be mined from the ’60s albums that followed, there isn’t an Abbey Road in the bunch. The Beach Boys also had only one true genius, Brian Wilson, and a lot of truly talented men who glowed with reflected talent. Maybe that’s why the group, scrambling to stay alive as the troubled Brian removed himself from the group’s day-to-day aspects, were able to rally rather than falling apart. In the early ’70s, they produced a string of fascinatingly unexpected albums, stretching from 1970’s Sunflower to the winningly bizarre return-of-Brian album Love You in 1977. But those are the facts. What about the spirit? Both The Beatles and The Beach Boys traced the arc of the 1960s, beginning with youthful enthusiasm, flowering into experimentation, then spinning off into disjunction and confusion. Ever-obsessed with innocence and the way it gets spoiled, Brian seemed to carry the spirit of the times inside him, waving goodbye to unspoiled youth with Pet Sounds’ final track, “Caroline No,” and never quite sounding as sure of any sentiment since. It’s one of those funny, tragic coincidences of history that the band who climbed the charts singing about “Fun Fun Fun” ended it by unwittingly recording a song by a murderous-mastermind-in-the-making, Dennis Wilson’s sometime running buddy Charles Manson, but it also feels like the right national soundtrack to a country sometimes blinded by an excess of sunshine. For me, the most obvious example of an American Beatles would be The Byrds. But since that’s almost too obvious, I’ll have to go with my gut and nominate The Replacements. While Paul Westerberg and crew didn’t make the same kind of over-the-counter cultural impact that The Beatles did, The Replacements traced a similar creative arc: from rowdy, hormone-driven rock ’n’ roll to a richer and more idiosyncratic strain of heart-swelling pop. Granted, The Replacements never got as experimental as The Beatles, but their off-kilter, deceptively well-crafted, smart-but-not-too-smart aesthetic lives on in bands like The Hold Steady, Wilco, and The Gaslight Anthem. Of course, The Replacements—ever the wiseass underdogs—named their 1984 masterpiece Let It Be; little did they know some jerk-off like me would still be taking that sly nod at face value 25 years later. 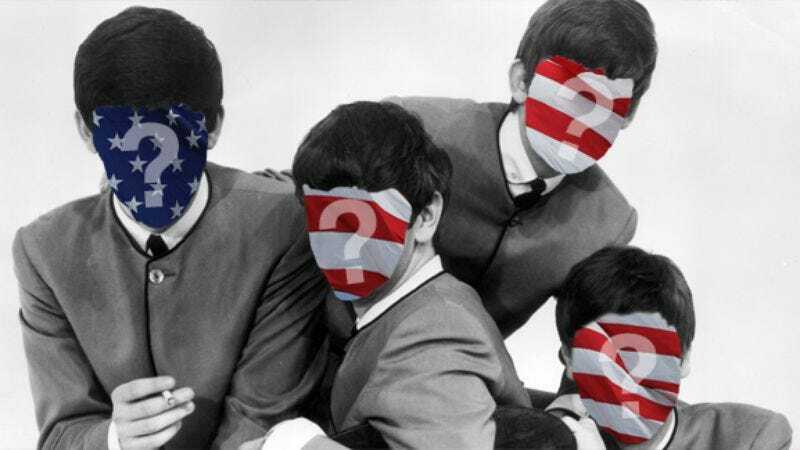 These two questions—who are the American Beatles, who is the Great American Rock Band (GARB)—really cut in two different directions. The Beatles both inspired intense mania and gave up performing early on. Any candidate for the American title would need to be composers and studio wizards first, performers a distant second. I agree with Keith: The Beach Boys are the obvious answer, head and shoulders above any other candidate. But when you talk about the GARB, you’re onto something completely different. The GARB should probably shine as performers as well as creative artists. They should embody and synthesize something of the American experience. In short, they should be the musical equivalent of the Great American Novel. And I’ll propose that The E Street Band is a possible answer. The music they make is profoundly American, not possible as a product of any other context. The urban and rural, traditional and novel, handcrafted and manufactured, meet in their sound. The songs for which they provide the swirling, muttering, yelping, and glory-glory-hallelujahing accompaniment are songs about the American experience. Yes, they don’t have a separate identity from solo artist Bruce Springsteen. But that puts them in a fine American tradition—a community called into being to do what the individual cannot do alone. The leader commits himself to the community and celebrates its highest ideals, bringing them up to his level. In that respect, The E Street Band stands in a line that includes The Band and The Heartbreakers, and diverges from more Beatlesque developments like The Replacements or Uncle Tupelo and progeny. When I hear the sounds that evoke The E Street Band in The Arcade Fire and Marah, I don’t just hear one influence among many, I hear a conscious effort to capture the heart of American music and unleash its energy and ideals. I’m with Donna on the GARB being the embodiment of the American experience, but as much as I love The E Street Band (and The Beach Boys and CCR and The Replacements and dozens of other stateside bands) to me there’s only one group that sums up what this country means musically and culturally in the modern era: Grateful Dead. Musically, The Dead incorporated the full spectrum of 20th-century popular music as it stood in the ’60s: blues, jazz, country, folk, R&B, early rock ’n’ roll, and drug-fueled “progressive” rock. If you wanted to introduce American music to somebody who had never heard it before, you could play any Dead record from the late ’60s and early ’70s and hit several birds with one stone. Culturally, Jerry Garcia and company exemplify the American ideals of individualism and adventurousness, as well as our burning desire to commodify those ideals. It’s the American way to touch absolutely everything and foster a love/hate relationship with the rest of the world, and that’s definitely true of The Dead, too. You don’t have to like this band to feel its influence. And, no, I’m not just talking about the fact that there’s always a new generation of hippie dudes ready to rise up and occupy our nation’s dorm rooms. There’s also the idea of alternative culture, which the Dead still represent better than anybody else. The Dead created a world around its music that was arguably more important than the music itself—and “music as experience” is a model that keeps getting copied to this day. The punks that flipped a bird to counterculture relics like Garcia were actually living out what he started, only with a different soundtrack and fashion sense. A great American band should have a great American story, and in that regard, it’s hard to trump Sly & The Family Stone. Sylvester Stewart was born in Texas, raised in the San Francisco Bay Area, and dabbled in different styles of music throughout his youth, performing with gospel acts, doo-wop acts, and rock acts while simultaneously working as an influential disc jockey and record producer. By the time he formed the interracial, cross-genre Sly & The Family Stone in 1966, the newly dubbed “Sly Stone” had re-absorbed the scattered seedlings of American music, and just as Elvis Presley helped carry R&B across racial lines, Stone carried rock ’n’ roll back to its original home. Sly & The Family Stone wrote and recorded hit singles that made people get up and dance, and they encouraged people of all races and genders to add their own ingredients to the dish—often one by one, as individuals. The rest of Stone’s story is relevant, too: how he took his position as a social prophet a little too seriously, and how he squandered his talent in a haze of drugs and star trips. But more than anything, Sly & The Family Stone are contenders for the music they made, which aimed to reach all Americans, and did so with gusto. This is a tough one for me, but I am going to posit Beastie Boys, both because their creative arc echoes The Beatles somewhat—snotty, boozy brats become pop stars, then begin exploring a sonic world all their own en route to becoming serious artists who also manage to sell serious levels of albums—and because they embody so much of what makes our country great. They single-handedly personify the musical melting pot while covering a vast sonic spectrum of genres and styles. Also, I’m pretty sure Ione Skye is their Yoko. Or maybe Tamra Davis. Or maybe she’s their Linda McCartney. Eh, the comparison pretty much crumbles at that point. The Beatles: motherfuckin’ 50 top 40 singles, 20 No. 1 hits (more than all these bands combined!) Assholes.